The AXIS Camera Station 4-Base E-Licence uses electronic delivery. When ordered there will be no physical delivery. Compared with traditional software licensing, eLicensing generates savings on delivery times, delivery costs, distribution costs, storage space and environmental impact. Generally speaking, each Axis network camera (image sensor, in technical terms) requires one AXIS Camera Station license. Some Axis network cameras contain more than one image sensor, which require the same number of licenses as the total number of image sensors contained. Note: The number of view areas supported by a camera doesn’t count, as long as there is only one image sensor in the camera, only one license is needed. For each Axis video encoder, the required number of AXIS Camera Station licenses is the same as the total number of analog cameras that can be connected to it. License for 1 additional Axis network video channel to AXIS Camera Station 4 or 10 license base pack. Requires the base pack to be pre-installed. E-licence. AXIS Camera Station is an IP-Surveillance software that works with Axis network cameras and video servers to provide video monitoring, recording and event management functions.With the AXIS Camera Station installed on your Windows PC, you can monitor your cameras, and at the same time, record high quality, digital video either continuously or on schedule, alarm and/or motion detection.The AXIS Camera Station offers easy ways to search for recorded events. In addition, the software has a multi-view playback feature that enables a user to view simultaneous recordings from different cameras to get a comprehensive picture of an event. Remote viewing and playback are also possible with the use of a Web browser or with the AXIS Camera Station's Windows client. The Windows client also enables remote administration of the software. The software allows for scalability, with easy addition of licenses for up to 25 cameras. License for 5 additional Axis network video channel to AXIS Camera Station 4 or 10 license base pack. Requires the base pack to be pre-installed. E-licence. 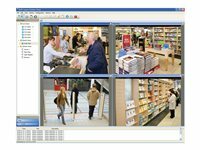 AXIS Camera Station is an IP-Surveillance software that works with Axis network cameras and video servers to provide video monitoring, recording and event management functions. With the AXIS Camera Station installed on your Windows PC, you can monitor your cameras, and at the same time, record high quality, digital video either continuously or on schedule, alarm and/or motion detection. The AXIS Camera Station offers easy ways to search for recorded events. In addition, the software has a multi-view playback feature that enables a user to view simultaneous recordings from different cameras to get a comprehensive picture of an event. Remote viewing and playback are also possible with the use of a Web browser or with the AXIS Camera Station's Windows client. The Windows client also enables remote administration of the software. The software allows for scalability, with easy addition of licenses for up to 25 cameras. A setup wizard with automatic camera discovery guides you through every step of the setup process. This allows the system to be up and running within minutes. 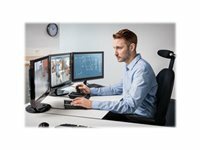 AXIS Camera Station is developed with focus on ease of use and intuitive operation, ensuring that anyone can effectively manage incidents and quickly export high definition evidence. AXIS Camera Station allows the user to add useful functionality such as AXIS A8004?VE Network Video Door Station for audiovisual identification and remote entry control, as well as AXIS C3003?E Network Horn Speaker that enables an operator to remotely address people and deter unwanted activity.